Situated next to the Wolf Academy, this late eighteenth century home is typical of the beautiful Georgian-style square cut limestone houses built by the Scots-Irish and German immigrants who settled in this area. 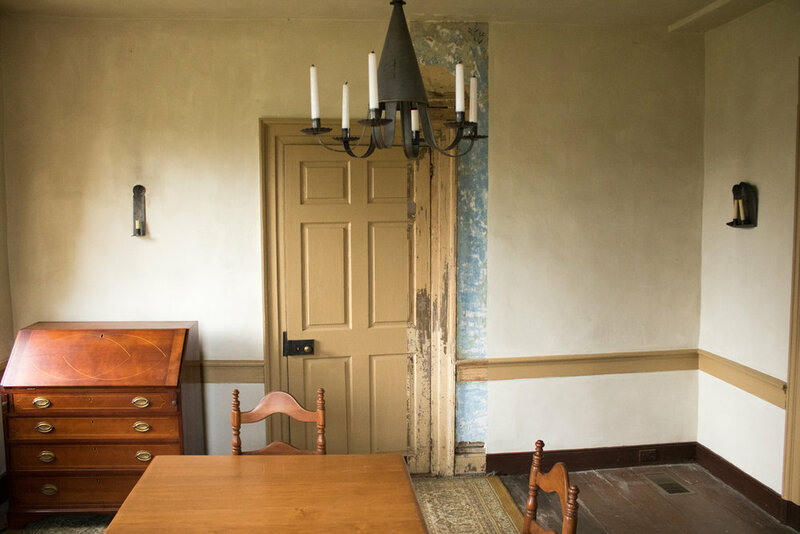 The large center hall 5-bay home was built by Captain James Ralston, a gentleman farmer and surveyor who in 1816 drew the plans that lay out the town of Bath. The property then came into the hands of Thomas McKeen, a storekeeper who would later become one of the city of Easton's most prominent citizens. McKeen most likely added the one story kitchen wing on the north side of the house, and is believed to have operated a store in the house's dirt floor basement. In 1981 the Governor Wolf Historical Society purchased the Ralston-McKeen house for $10,000. The home consists of ten rooms, six of which have their original fireplaces. Although abandoned for many years, nearly all of the original trim and fireplace mantels remained. Over the years, work was done to repair plaster walls and ceilings, scrape and paint woodwork, repoint the exterior stone, repair chimneys, patch and repair floorboards, and install a heating system. A new cedar shake roof was installed in 2017. In 2016, work was begun to restore the kitchen wing to its original one storey configuration. Stone walls were rebuilt and a "walk-in" fireplace reconstructed on the foundation of the original. There is much work that remains to complete the restoration of this wing, including all interior millwork, plaster repairs, and restoration of the exterior doors.